Let's just say that again: Hasselblad announces 50MP camera! 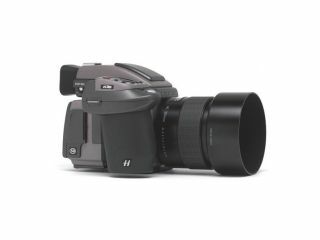 Medium-format camera manufacturer Hasselblad has announced a new camera that is the ultimate in imaging technology. Sporting an unbelievable 50MP, the H3DII-50 utilises a Kodak 50MP 36×48mm – which is twice the size of a normal 35mm DSLR sensor, and is claimed by the company to be the world's largest. The H3DII-50 is quite obviously not a camera for your average snapper. As is the case with most Hasselblad cams, its latest release is aimed squarely at the high-end commercial photographer who, according to the company, "requires the ultimate in both image quality and performance." So, what can you expect from the H3DII-50? For a start, the camera produces some of the most hi-resolution files available, with images coming out at 300MB. Then there's the 1fps capture rate, which for a medium-format is very fast indeed. ISO can be from 40-100 or can be boosted to up to 800, with Hasselblad's enclosed software. The H3DII-50 will be released in October for the bank-breaking sum of £18,500. Get in quick, though, and you will get a free lens, according to the blurb on the website.